We’re all generating data faster than storage providers can keep up, and that problem is only going to get worse. On Friday, Western Digital announced a potential game changer that promises to expand the limits of traditional HDDs to up to 40TBs using a microwave-based write head, and the company says it will be available to the public in 2019. While it seems every time you turn around someone is offering a theoretical “breakthrough,” most of us still have spinning platters in our PCs. There are a lot of reasons for this but Greg Schulz, a storage analyst and operator of StorageIO, tells Gizmodo that it all boils down to one thing, “economics.” Innovations in storing data on solid state drives aren’t coming fast enough to keep up with the amount of data we create, the cost of flash storage is still high, and manufacturing infrastructure needed for supply hasn’t kept pace with demand. 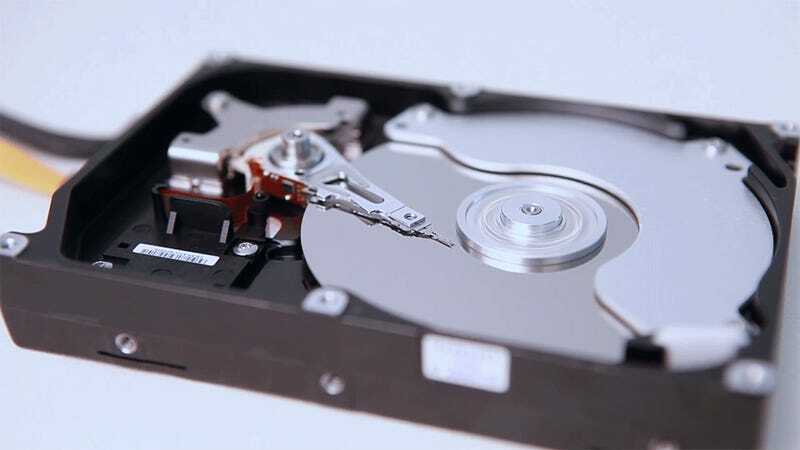 Western Digital’s new approach, microwave-assisted magnetic recording (MAMR), can utilize the company’s existing production chain to cram a lot more storage onto a 3.5-inch disk. In a technical overview, Western Digital says it has managed to overcome the biggest issue with traditional HDD drive storage—the size of the write head. These days, an average hard drive maxes out in the 10-14TB range. But by integrating a new write head, “a spin torque oscillator,” microwaves can create the energy levels necessary for copying data within a lower magnetic field than was ever previously possible. There’s a more thorough white paper for those who want to dive in. For the average consumer, the most important thing to understand is that the industry wanted to cram more information into the same disk space, it hit a wall, and microwaves appear to have opened up new possibilities. According to Western Digital, MAMR has “the capability to extend areal density gains up to 4 Terabits per square inch.” By the year 2025, it hopes to be packing 40TBs into the same size drive it offers today. While the idea of cramming more storage into the same technology we’ve been using for years may not sound like the most exciting development, it’s the best option we have right now. And this is only giving us a boost in capacity, not performance, that’s why hybrid systems are so important. Schulz points out that we are always relying on classic memory hierarchies to support demand. At the moment, cloud storage providers are using solid state memory, HDDs, and magnetic tape simultaneously to keep up with demand. “There’s no such thing as an information or data recession, there’s more being generated every year,” he says. So we have to keep innovating on old, new, and future technologies while finding the optimal way to make them work together. Schulz says that flash storage just won’t be able to keep up with the amount of data being produced “for the foreseeable future, maybe well into the next decade.” Part of the reason for that is the expansion of consumer products that are snapping up all the flash storage. What he sees as the ideal immediate future is a combination of 3D Xpoint SSD like Intel’s Optane Memory handling the front end, and the slower, more cost-effective MAMR tech handling the bulk storage. “They’re absolutely better together,” he says.